According to the publication, the rankings evaluate colleges and universities on 16 measures of academic quality, including first-year student retention, graduation rates, and the strength of the faculty following the Carnegie Classification of Institutions of Higher Education's Basic Classification. 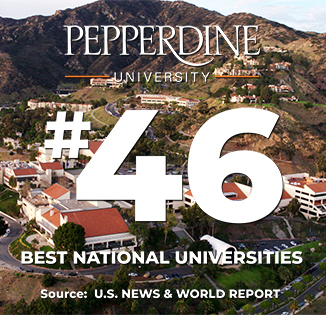 Advancing one spot to number 44, Pepperdine’s Seaver College was recognized as maintaining one of the country’s “Best Undergraduate Business Programs,” a ranking that is determined solely by surveys of business school deans and senior faculty. Placing at number 20, Pepperdine was named as one of America’s “Best Colleges for Veterans.” Pepperdine is an active participant in the Yellow Ribbon GI Education Enhancement Program, which enables 80 percent of the University’s current student veterans to attend tuition-free. For additional information about the 2019 rankings, visit the U.S. News & World Report website.